Some mornings, Norton is all smiles. He cooperates with his diaper change instead of fighting like an angry bear. He’s cute and doing wonderfully fun things like playing with blocks or pushing himself across the room in his riding toy. Then there are mornings like today. Instead of knocking on the door or making happy noises to let me know that he’s ready to be liberated from his room, he chose to announce his desires by letting out this ear splitting screech. This is the screech that triggers migraines and can easily put me on the floor. It’s like human dog whistle or something, and it hurts. I went in to change him and get him ready for the day. Cue lots of fighting, kicking, and screaming. When he started yelling at me again, I just gritted my teeth and worked through it. I did my best to dodge the kicking. (He hates diaper changes because he’s ticklish and the wipes make him nuts.) When we were done and heading into the kitchen for breakfast, I thought for sure that the worst was over. 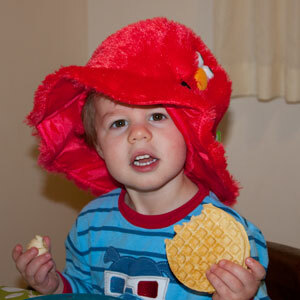 He climbed into his chair and said “Waffle!” When the waffle wasn’t instant, he started to scream again. He stopped. For a moment, there was blissful silence. Then he opened his mouth once more. Inwardly, I prepared myself for another bout of ear splitting toddler screaming. We may have started out the morning screaming, but we did get to using our words and being happy. And that was it. There was no more screaming while I got his banana, milk, and waffle ready for him. He happily wore his hat whilst I fixed his plate. When he wanted more banana, he said “More.” (Well, it sounds like “moi,” really, but it’s his way of saying it and we get it.) When he was done, he didn’t throw his plate. He just stood up in his chair and said “Down.” (Okay, more like “dow.) No food was thrown. No more raging. It was beautifully calm and mellow. Toddler talking really is making a difference in life. It’s a good difference, and one that I’ll happily take. It’s amazing to see him progress after the language delay issues that we’ve dealt with. How do you get your toddler to stop screaming and actually talk instead of rage? Sounds like he is growing up so quickly!